There is a lot we can talk about with these four simple words. Know - "to have understanding"
When - "at what time"
To - ".. a function word to indicate an action...."
Water - "to moisten, sprinkle, or soak with water "
If we take the word "know" out of the phrase, the idea is simple "at what time do we take action to moisten with water?" 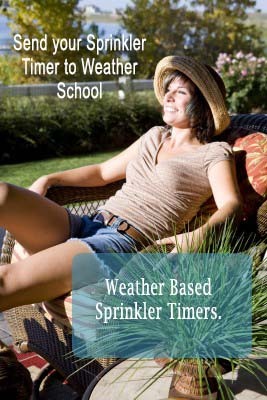 Most sprinkler controllers don't know when to water, they are programmed to come on a set a time. Standard sprinkler controllers do not understand the plant's need for water. That four letter word "know" makes all the difference. Without knowing when to water we will either waste water or stress plants. "To have an understanding" of when to water is not a simple task. Most of the time when people stand in front of a sprinkler controller they are intimidated. First by how to program the controller but even more, by what settings are right. I have been in this industry for 35 years. I am often asked how to program a controller. There is not an easy answer; there is more to it than meets the eye. If it was easy we wouldn't be wasting so much water. So what do you need to "understand" about when to water? There is a lot. Landscape conditions including the plant and soil type, root depth and exposure, all come into play. The sprinkler system itself is another variable, How much water do the sprinklers apply? How evenly do they distribute water? Enter yet another variable - the weather. How fast is the water evaporating? There are a lot a variables, Fortunately landscape conditions and sprinkler system performance are constant for each zone you water. So if you have a good base irrigation schedule then modify the schedule based on the weather, and watering will be more efficient. The next step is even harder. How can the average person "understand" the relationship between weather and altering irrigation schedules? Most of the time we are in a reactive mode. In other words, when the lawn is stressed, the time gets turned up. But we often wait too long before turning it down, so we waste water. The mentality "a little is good, then a lot must be better" wastes water and impacts landscape health. So how do we solve this? Look to the propeller heads, the geek squad with pocket protectors have figured it out. They created, refined and proved formulas that take climate measurements to know how much water evaporated from the soil. Along with smart phones comes a new generation of sprinkler controllers. "Smart" irrigation controllers know when to water; well some of them do. There is a big range in quality and unfortunately there is not enough good third party data to help identify the differences. You will need to judge for yourself. But ask a few questions. How many sensors are used to measure evaporation? Proven science tells us four; wind, humidity, sunshine and temperature. Then ask about the quality and reliability of the sensors. Rain is another big issue, does the "smart" controller measure rain to know how much rain fell, or does it just use a crude rain-shut-off device. And last, does it know when to water? Too many "smart" controllers do not know when to water; they just scale back the run time. For example, it makes no sense to take a 10-minute run-time and scale it back to 3 minutes. Sensor input and the logic built into the processor make a controller "smart:" giving it understanding to know when to water. Over the life of your landscape you will spend more money on water than you did to have the landscape installed. Water is the life blood for your plants. Climate controlled irrigation sustains healthy landscapes, uses water efficiently and saves money. The Weather Reach Controller Link knows when to water.